This is spring break for the UNC system, and spring-like temperatures have finally arrived. Flowers are budding and pretty birds are foraging the new growth. The library is quiet as expected but there are still some business faculty, graduate students, and one Export Odyssey student team working on their research. It’s been a nice break before some extra teaching next week, and then ACRL the week after that. The event is Saturday, March 28 at 9:45 AM in Portland Ballroom 253 of the Convention Center. UNCG looked at the Villanova and Johns Hopkins models of centralized liaison organization as benchmarks for our own liaison shake-up. Jutta and I met at LOEX last year but Margaret and I have only chatted on the phone. So it will be fun to all meet up in person. We plan on leaving plenty of time for discussions with the libraries who attend. (Look here for a recap by April). My wife Carol from Wake Forest University is speaking at the same day and time — in the adjacent room! (If we yell maybe we could hear each other through the ballroom’s movable wall.) Her program is “Weed it and Reap: Successful Strategies for Re-shaping Collections“; she is working with librarians from St. Olaf College and Macalester College. I didn’t read this new article in time to include it in my last post: “Teaching students what we do: A collection management course” by Tony Horava, in the March 2015 issue of College & Research Libraries News. Tony describes a LIS collections class firmly grounded in the modern realities of library collection management. He also describes some very interesting active learning assignments for the students. Sort of an epilogue to our recent liaison reorganization. Our AD of Public Services, Kathy Crowe (also a liaison) asked us to define our liaisons roles as a tool for planning, evaluation, assessment, and recruitment. Creating our liaison roles document proved to be quick and easy compared to our long reorg process. Now this is not innovative work on our part – other libraries have worked on and published very thoughtful strategic planning documents on liaison roles. The main theme seems to be liaison work moving from a focus on collections to a focus on engagement. The published history of this theme was discussed in the RUSA Quarterly article “Outreach Activities for Librarian Liaisons” by Isabel D. Silver (see last post, item 3). Three of us –colleagues Mark Schumacher, Jenny Dale, and me – volunteered to start the process of creating this document. We reviewed the Minnesota, Duke, and Washington documents. We really liked Duke’s use of best practices. Washington provided similar examples if you click through to the “More information at…” pages. We decided our document would include defining aspects of each role as well as best practice examples. A few weeks later we met with most of the liaisons at one of our monthly, hour-long liaison workshops, where all subject and functional team members are invited to a discussion on prearranged topics. Folks knew we were gathering to draft our roles document. Afterwards Mark, Jenny, and I would clean it up and email it out for further suggestions and edits. We divided the assembled folks into five groups and gave each group a sheet with one of the five roles on top. The sheet had two sections: one labeled “define this role”, the other “best practices for this role”. Each group spent 15 minutes working on their definition. Then we shared. The most interesting idea came from the “Outreach and Engagement” team, who said they struggled to define that topic independently of the other four. (Jenny, Mark, and I had discussed that problem earlier.) That group proposed we remove “outreach” as a role and instead cover that topic in the introduction of our proposed document. Then we had the five groups pass their sheet to the next group clockwise, and work on some best practices for the role listed on their new sheet. Then Mark, Jenny, and I typed up the ideas on the five sheets, standardized the verb tenses, and wrote an introduction. 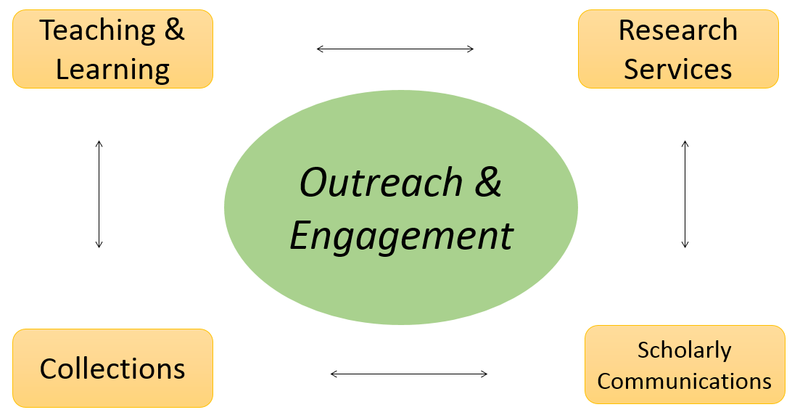 You can see below how we handled “outreach & engagement”. We received a few suggestions after emailing out the first draft. Today I emailed the second draft to library administration for final approval. I’m guessing the admins won’t ask for significant changes. The roles of library liaisons (subject specialists assigned to academic disciplines) continue to evolve. This document describes both ongoing and new roles in order to assist with planning, evaluation, assessment, and recruitment. Best practices for each role are included to provide concrete examples of effective work. The ethos of liaison work is a mindset of outreach to and proactive engagement with UNCG students, faculty, staff and administrators. Liaisons might also work with alumni, other researchers, and community members. This outreach mindset permeates all four functional liaison roles described below. Seek opportunities to collaborate and establish partnerships in research, teaching, advocacy, etc. Provide information literacy and research instruction to distance and residential classes via guest instruction, teaching or co-teaching credit-classes, online learning objects, etc. Developing teaching and assessment skills through conferences, workshops, team-teaching, observing others teach, etc. Educate and inform faculty, graduate students, and campus administrators about scholarly communication issues, copyright, author rights, etc. Investigate and promote new avenues of scholarly communication such as open access publishing, institutional repositories, journal hosting, etc. Attending workshops, webinars and forums sponsored by the Scholarly Communication Team, ACRL, etc.